Qosina offers a variety of valves that are in stock and ready for immediate delivery. Qosina part # QOS5402597N is a trumpet style TRAC™ valve manufactured by B. Braun that manually opens a path for irrigation upon depression of the blue plunger, and automatically closes when released. Made of polycarbonate, santoprene and stainless steel, this in-line valve features a 0.189 inch ID x 0.257 inch OD sideport and 0.27 - 0.266 inch ID x 0.282 inch - 0.278 inch OD bottom port. Qosina offers a variety of syringes, tubing and needleless injection sites to fit your project needs. Qosina offers a variety of valves that are in stock and ready for immediate delivery. Qosina part # QOS5402610N is a large bore, trumpet style TRAC™ valve manufactured by B. Braun that manually opens a path for irrigation upon depression of the white plunger, and automatically closes when released. 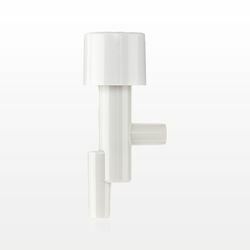 Made of polycarbonate, santoprene and stainless steel, this in-line valve features a male luer slip inlet and outlet. Qosina offers a variety of syringes, tubing and needleless injection sites to fit your project needs.